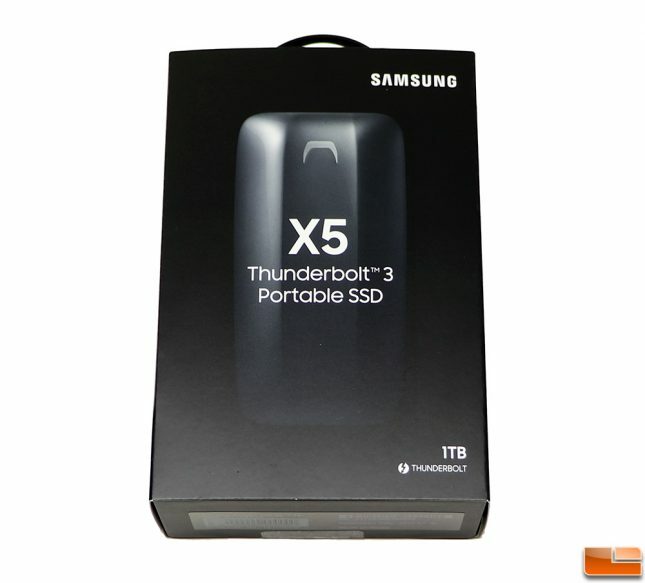 Samsung is entering the Thunderbolt 3 market today by unveiling their first-ever NVMe-based portable solid state drive (SSD) – the Samsung Portable SSD X5. The X5 series features speeds of up to 2,800 MB/s read and 2,300 MB/s write, making it an ideal portable storage device for content creators, enthusiasts or anyone that wants access to their files quickly while on the go. Supporting both Mac and Windows PC systems, the X5 is available in 500GB, 1TB and 2TB capacities for $399.99, $699.99 and $1399.99, respectively. Thunderbolt 3 is becoming more popular as it can handle data transfer at up to 40Gbps (5000 MB/s), potentially four times as fast as USB 3.1 Gen 2 at 10Gbps (1250 MB/s). 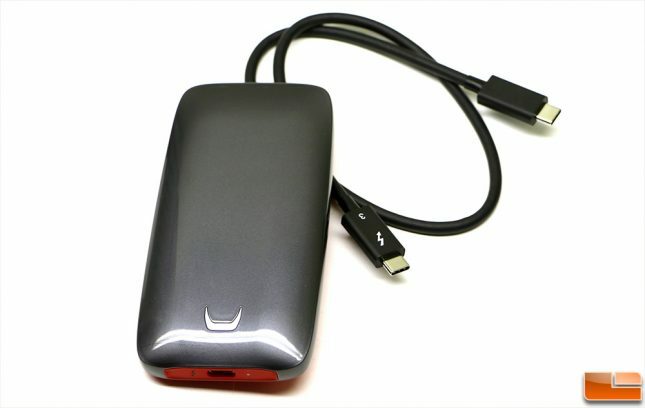 Thunderbolt 3 is capable of 100 Watts of bi-direction power, so an external power supply is not needed for portable SSD models like the X5. For this review we will be taking a closer look at the X5 1TB that runs $699.99 shipped. All X5 models come with a Thunderbolt 3 cable and are backed by a 3-year warranty. The retail packaging is nice and the unboxing experience was pleasant. 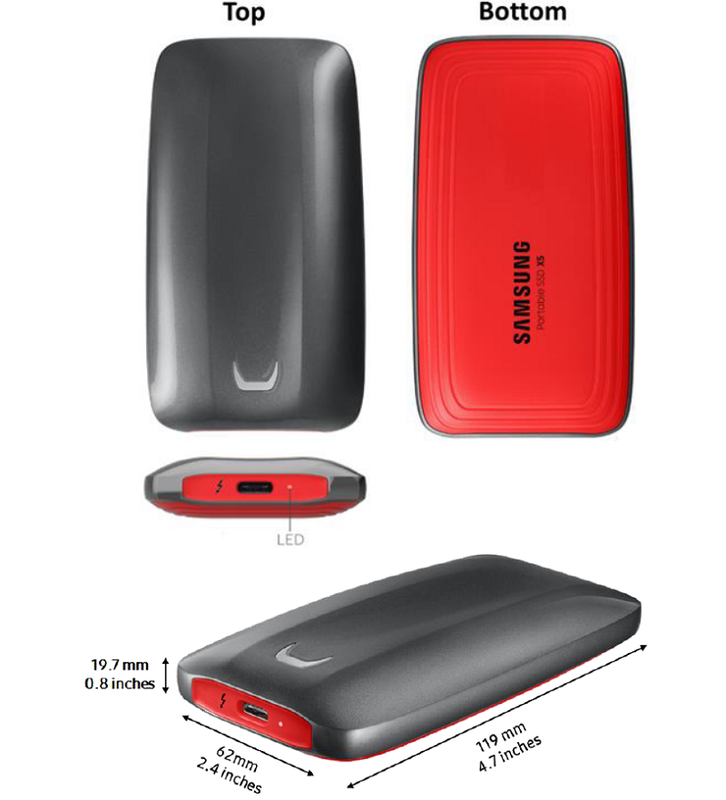 The Samsung Portable SSD X5 measures 119mm x 62mm x 19.7mm (LxWxH) and weights in at roughly 150g or 5.3 ounces. This makes it very portable and the magnesium enclosure gives you confidence that it can take a good drop and keep on going. In fact, Samsung says that the X5 can survive a drop of up to 2 meters just fine. 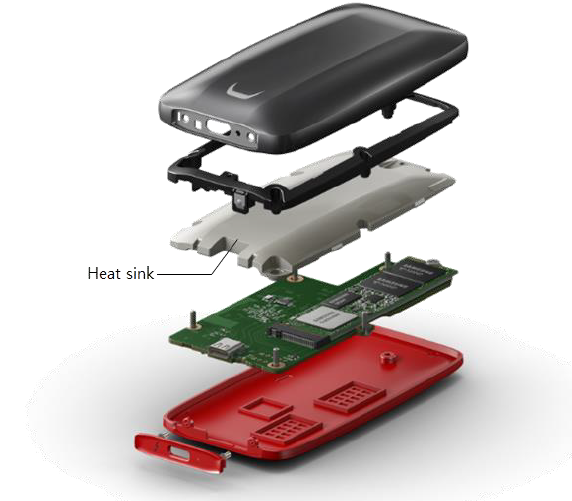 Inside the Samsung Portable SSD X5 you’ll find a Samsung SSD 970 EVO SSD M.2 PCIe drive with an aluminum heatsink. The Samsung SSD 970 EVO (review) uses their in-house 64-layer V-NAND and Phoenix controller. To get inside this device you need to remove the sticker on the back of the drive that has your serial number on it to gain access to the screw that holds the housing together. 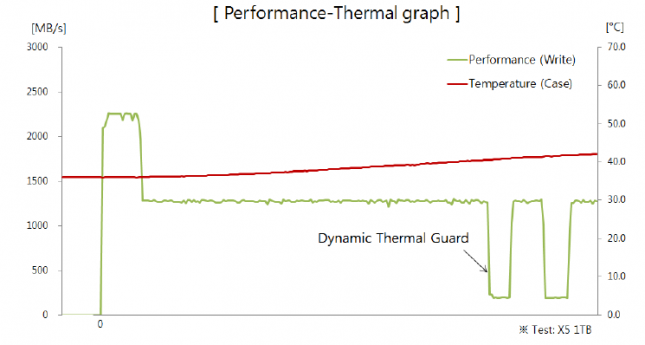 The X5 uses Samsung’s Dynamic Thermal Guard technology to keep the drive from overheating. This means that in period of heavy sustained writes that performance will drop if the drive senses that the temperature is getting too hot. So, performance will drop once the SLC cache is filled up and then again if you trigger the drives thermal protection features. The performance drop in both of these events is large as you can see from the chart below, but are only reached when moving hundreds of gigabytes of data at a time without any breaks for the drive to recover. 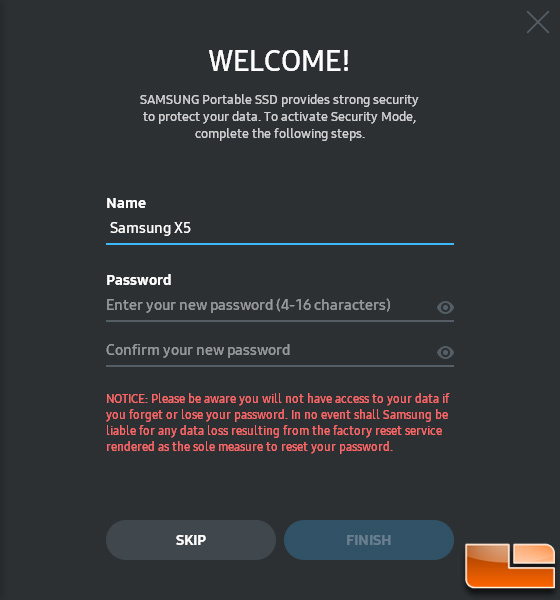 The Samsung X5 Thunderbolt 3 Portable SSD also supports full AES 256-bit hardware encryption, which is great for those that need GDPR compliance. The software needed to secure the X5 is already on the drive for both Windows and Mac users. All you need to do is install the software, run the application and set your password to enable encryption. 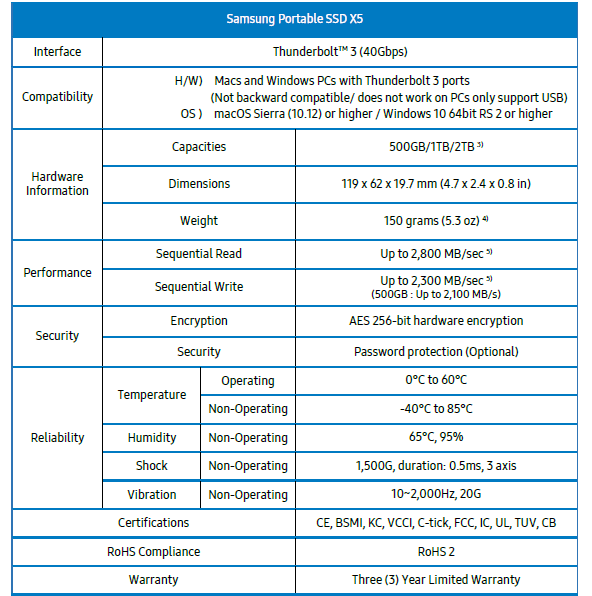 Here are the full specifications for the Samsung Portable SSD X5 series for those that like to look over them. Note that the performance of the X5 500GB drive is slightly lower when it comes to write speeds as it is rated at up to 2,100 MB/s and not 2,300 MB/s like the 1TB and 2TB models. This is a pretty straight forward product, so let’s take a look at some performance tests to see how fast this Thunderbolt 3 device is on our desktop PC.